Goa was always in my “Places to visit” list. Although I have been to Goa before in an office visit, it was very different this time, less lavish and a lot more fun. I took a bus from Hyderabad to Panjim. You won’t feel it like a 15 hours long journey if you love writing or something else to keep you busy. Unfortunately, I chose to travel after just 2 days Indian PM’s demonetization move. I usually don’t keep cash with me which I regretted badly in the trip. Good thing was that most of the taxi owners agreed to get the pay in form of diesel. I reached Panjim at 10:00 in the morning. I took a taxi from there to Simrose which costed 1800 INR. Agonda beach is just outside of the resort. Rest of the day I spent wandering on the beach. As an amateur photographer, I was mostly interested in shooting sunset. Sadly, Agonda beach didn’t happen to be a good place to witness sunset. Sunset was quick and the sky was dull and washed out. I managed to click few pics. 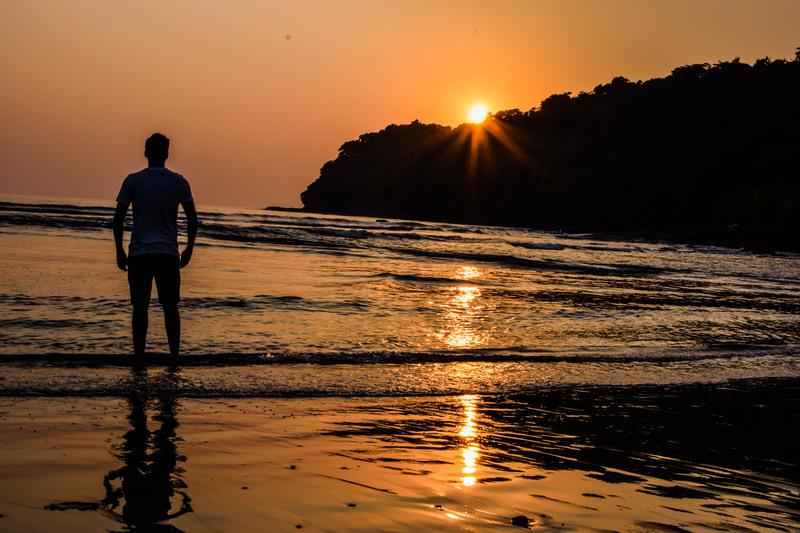 One thing that attracts tourists to South Goa is its secludeness. It is a disappointment if you are party goer and love crowd. However, there is one good thing. There is a DJ that is organized every friday and that is just 30 minutes taxi distance from Agonda. Leopard Valley is a place located amidst the forest kind of environment and if you love to lock and pop your body in loud music under the sky, this is just the place for you. I was lucky because it is closed in monsoons. And it was opened after a long break on the day I reached. Huge foreign crowd and drinks. The main purpose of Goa visit was fashion Photoshoot and it started on the second day. I spent full day in shooting. It was exhausting and so much fun. Third day was also spent in fashion Photoshoot. It was so exciting to witness glamour and fashion. Models were very helpful and it was easy to shoot in a pose I like. Thanks to Simrose for offering such a great view. The sound of waves striking the sea coast and a bottle of chilled beer combined with mouth watering delicious aromatic food was enough to relieve the tiredness. I booked a motor boat to go to Palm beach. It was 120 minutes up and down ride. The beach had a small waterfall and a small hill. It was even less crowded than Agonda. Plan early. If you’re sure about the dates you are planning to visit, book flight tickets ASAP. I procrastinated and delayed booking tickets by 10 hours, and ticket cost inflated 1.8 folds.